Does not rust or smoke. Resists the wind. 4.5 hours of continuous light at the brightest level (30 lumens) – without mains power. 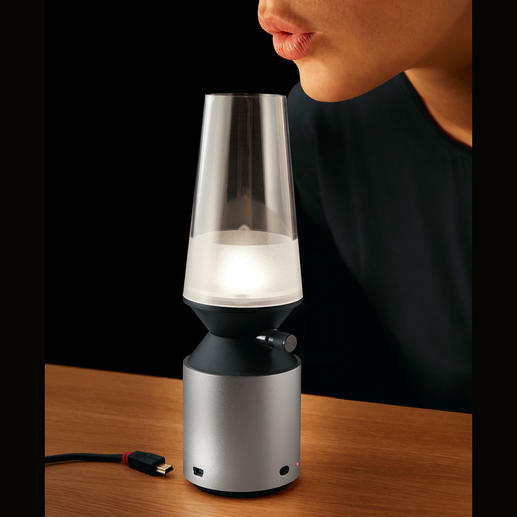 Cool LED lantern that you can blown on and off (instead of switching). Ingenious sensor control astonishes your guests and provides atmospheric dimmable light. Suitable for both indoors and outdoors. Briefly blow into the cylinder and the LED bulb turns on. Blow again and the LED bulb goes off. A cool trick that will amaze every onlooker. This lantern is perfect for the garden, on the terrace or balcony, and also for camping. In addition, it makes a nice bedside lamp or decorative lighting accent. The purist design of the modern lantern blends perfectly with any environment: With stylish base, cylinder and, of course, flickering LED light (instead of an open flame). Built-in Li-ion battery. Charging time approx. 2 hours (USB cable included). Aluminium coated ABS base with an elegant matt finish and built-in 0.4W LED bulb (lighting time approx. 35,000 hours). Cylinder made of sturdy polystyrene. Size 6.5 x 20.5cm (2.6" x 8.1") (diameter x H), weight 220g (7.8 oz). I use it as a night light when my young grandson stays, it lasts all night on low setting so will be handy for holidays.